Designed for retrofit and new construction, Evolution Series 4” Recessed Poke-Thru devices provide convenient access to power, communications, and audio/video services recessed below floor level - providing maximum device protection. With 2 Gangs of capacity, you will be able to configure services for the needs of your space. The low-profile metal covers are available in brushed aluminum, satin brass, satin nickel, and multiple powder-coated finishes designed to match any space. Evolution Series 4” Poke-Thru devices are the perfect fit for kiosks, training rooms, classrooms, healthcare facilities or commercial buildings with open-space architecture. • Prewired assembly: Save on labor with a completely assembled, prewired poke-thru . 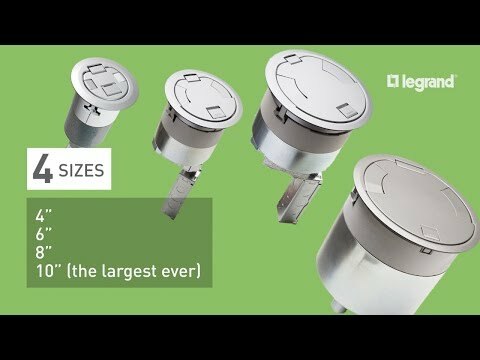 • Controlled receptacles: The only option on the market with two marked receptacles in a 4" poke-thru that also meets Title 24 Plug Load Control standards. • Surface style cover assemblies: A surface style cover is for mounting on top of the finished floor surface. The surface cover is designed to be used for carpet, tile, wood, polished concrete, or terrazzo.